Okay! Musume Time: Let's Go to My Future! 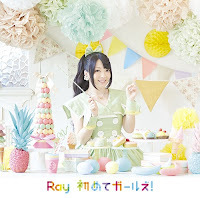 Ray's 'Hajimete Girls' Single Review! Let's Go to My Future! Ray's 'Hajimete Girls' Single Review! Whenever I listen to Anime Music, I swear, I rewind to 10 years ago, and 13 year old Chiima escapes for a little while! Much like many of the Idol groups and singers I have come to love in my short time as an Idol Blogger and enthusiast, I found out about the Anime Soloist Ray through my random ventures on youtube, where I stumbled upon and watched a short video of hers for her Summer 2015 single, Secret arms, and then eventually I stumbled upon the single I will be reviewing today, Hajimete Girls! Though she may not be a new singer on the Idol Block by any means, having debuted back in 2012, she is still rather new to me as a listener, but I can say with complete honesty that after hearing Secret arms, I really do like Ray and what she has to offer. Energetic and enthusiastic in both her singing and on-camera performance, Ray is certainly a delight when you get into what she has to offer. She's almost like Koharu Kusumi now that I think about it, with an amazing amount of charisma, but a far more superior singing voice. She's cute, a little goofy and all around fun to watch and listen when you pop on a song of hers. Really, if it's Ray you're listening to, I think there will be a song of hers you may just find yourself getting into and probably not escaping for a while. With the short introduction over and done with, I'm going to get into a Review that I have been itching to do for a while. It's time to kick back and relax, put on some music by Ray, and take a look at one of her latest single releases, the energetic Hajimete Girls!. Are you ready to bring out the inner Anime fan in you with this peppy music? If yes, then let's enjoy some music together and GO!!! The title song from Ray's 7th single release overall and the first on the track list, Hajimete Girls! is basically everything you could imagine when you think of a girly, energetic shoujo anime song, but even when you have an idea of what it may sound like, it really doesn't disappoint. Ray is an incredible choice for this song, simply because of her voice and how great she is at expressing emotion within her voice. Not only is Ray energetic and cheerful, but she also knows how to put feeling into the song whilst still sounding every bit as cute as an anime character at the same time. She really has a great talent, and she makes the song enjoyable from her singing performance alone. In fact, it's the way she sings in Hajimete Girls! that made me listen to the song more and more, and not the composition or how catchy it is. This time around, it was how Ray sounded and the effort she put into making the song feel colourful and alive that made me fall in love with Hajimete Girls! I've listened to this song quite a lot since stumbling upon it, and with every listen I enjoy it even more. The song just reminds me of my teenage years where I absolutely adored anime and the music it had to offer, the vibrancy of the songs and how happy they made me feel whenever I heard them and watched them to the opening sequence of whatever series I happened to be watching at the time. Listening to Hajimete Girls! is a little like a flashback for me, and I feel so alive when it comes on. The fact that it's brimming with energy, a cheerful instrumental and a wonderful singer just makes me even happier, and really, it isn't too hard for me to fall for this song over and over again. It's addicting, a little like sugar. This song is my sugar addiction. Regarding the video for the song, I won't lie and say I love it, because in fact, I was rather disappointed with how poorly it fit the song. It's a cute video, yes, and it's very cheerful, fast paced and nice to look at, heck I chuckled a bit during one scene, but when watching it I feel like it doesn't represent the song in its entirety. Hearing this song, you expect vibrant colours, energetic dancing and something a lot more fun than what is given. It's a cute video, but no, it does not do the song justice at all from what I can see, in fact, it slows the song down for me, and that's a no no to my ears. It's a good thing I actually just prefer listening to the song alone on a loop, isn't it? Video aside, Hajimete Girls! is a wonderful song and a great portrayal of how amazing Ray's voice is and just how passionate she can become. It's one of my current favourites from August until now, and I've been playing it on a loop for the past few days. My neighbours might just hate me now. The second song on the single, My Future is what I would call the 'cooler' song of the two, though with Ray's sweet and cheerful voice, it's not that cool, but it's definitely not as peppy or cutesy as what Hajimete Girls! is. My Future is upbeat, probably a little more emotional in its instrumental sound, and plays like the ending track to a school-life anime that has a bit of drama in it. It's also the better track of the two for me, and of course my favourite from the few songs given here. It's Ray's voice and how she sings that really captures me here, and every time I listen to it I can see the colours and paint a story for myself just through hearing her voice. Through this song, I imagine something beautiful as I listen to the emotions expressed through Ray's voice. More driven in emotion and one that feels like it moves forward to a more positive end in terms of its lyrics, My Future is an expressive and surprisingly powerful pop song that really shows off Ray's voice and how great she can be. She's wonderful at being cheerful and cute, but here you forget that she's cute, and I just can't help but focus on the power she has, and the emotion that she throws into her singing. My Future is positive, and it certainly builds up to a wonderful climax at the end of the song where Ray truly gives it her all. At least, that's what I think. You could think a totally different thing to me when hearing this song, right? Unless it's Mermaid Melody or Love Live!, really, I don't give a rat's arse as to whether or not the cast of the anime sang this song, because honestly, anime voice actresses and their fake cutesy singing voices really bug me for some reason. This version of Hajimete Girls! is basically the cover of what Ray has already done, though it includes the vocals of the main characters, and surprisingly, they do make it their own and add in their own little quirks at certain points of the song, and I admit, they do make it interesting. They just don't make it colourful, and the personality in it feels a little flat. I'm biased, and yes, I prefer the Ray version over this one any day, but by no means is this a bad rendition of the song. It's pretty fun in its own way, though some of the vocals are annoying in it, but it lacks that charisma, colour, vibrancy and enthusiasm that Ray portrayed so beautifully in her version of the song. In many ways, the anime cast version sounds like a bunch of J-pop Idols who can't be bothered with the song they are given, and put in half the effort they usually have to sing it. It's a cute song, but seriously, Ray's version is far more superior, and its definitely the one I listen to more when I put this song on. In fact, this is the one song that gets ignored, and for me, there's good reason to ignore it! I really do think that Hajimete Girls! is a great single if you don't include the third song. It's fun, packed with energy and charisma courtesy of Ray, and it's wonderful to listen to over and over again if you're the sort of person to loop something for a long time! As a single, this has become a solid favourite of mine for the past month or so and one I think of (and listen to!) quite frequently. I love the bright sound it has, the emotion in Ray's voice and the overall charm that Ray has. I really feel like she enjoyed this performance, and that she wants us, her audience and listeners, to enjoy the song just as much as she enjoyed singing and creating the atmosphere for it. It's a good single, one that I can see myself continuing to listen to in the near future, possibly even longer. Catchy, atmospheric, colourful, cheerful, sweet and playful, that is this single to T, and if that is something you look for in a song, then I do highly recommend that you listen to Hajimete Girls! and give Ray a go as a singer. Seriously, she is wonderful. Then again, I have become a little biased. Oh, well!!! Because I really love this single, I give it 4 and a half stars! I would honestly be enthusiastic and give it the full-fat five star rating, if only it wasn't for the last song on the track list that kind of ruined the fun and wonderful feel of the rest of it for me. That said, no single is perfect, and it just so happens that the one flaw in this track list happened to be an Anime cast version, though really, it didn't totally ruin it for me. I mean, I am still listening to the rest of the single, right? RIGHT!!! Have you heard of Ray before, and if you have, which song of hers happens to be your favourite? Do you have any recommendations for me, as I have yet to still hear her other songs? If not, what did you think of Hajimete Girls!? Please, let me know! Awww, thank you! And yes, Anime songs are great for bringing out that nostalgia, aren't they? Regarding Idolminded, I really don't know. I have emailed Ray to ask how he is, but I won't know until he replies. I've been a bit worried too, but hopefully I'll hear from him soon!